I recently just got around to reading Stardust by Neil Gaiman. I liked it. It's a fun light fantasy novel of the adventure sort. Here's my copy of Stardust. I got it signed this past summer at a Neil Gaiman book signing. I had purposely bought a Neil Gaiman book that I hadn't read before to take event. 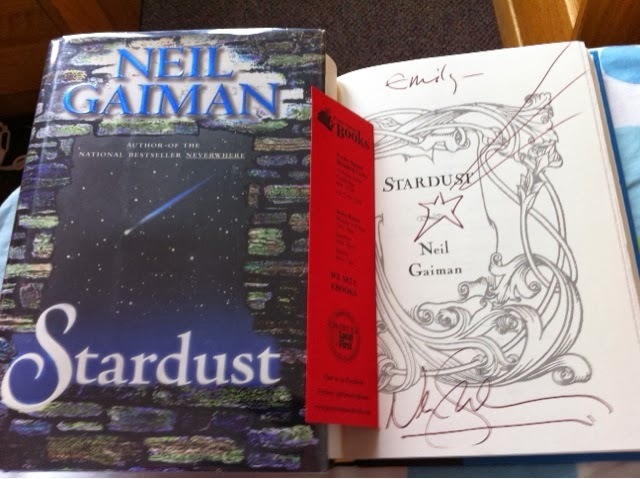 It was a win-win situation: I got a new Neil Gaiman book to read and a Neil Gaiman book autographed by Neil himself. Pretty awesome! Yesterday night, I watched the film adaptation. Although, the main characters are pretty much the same, the surrounding cast varied quite a bit. The backstory with Tristran's father Dustin is almost completely altered. The film added a bunch of dramatic flair about Captain Shakespeare which didn't happen in the novel. The film was also kind of awkwardly paced at the beginning but it got better. Some of the plot was also too convenient at times (I liked the talking tree over the talking moon, which was kind of lame, presentation wise at least.) Um, what else, Victoria was kind of already annoying in the novel, and the movie made her even more annoying and unlikeable. But I did like the two leads, Tristran and Yvaine, from the film. Overall, I liked the novel better. It was far more fantastical. Also, I doodled in some of the characters in the margins of my probability notes as I was reading Stardust. They are what I thought the characters would look like. However, I've since looked at some artwork for the comic by Charles Vess and my character designs are no where close. Meh. I seemed to have the opposite view for every character. Victoria -- yeah, she's kind of whatever. I tried to draw her as the stereotypical Hollywood beauty. Lady Una -- for some reason I thought of Lady Una as very catlike and tolkien-elf-like with a gypsy spin. And for some reason I got the interepeation that she was petite and very thin, slaves are usually not fed well. So I drew her with angular features, a sense of nobility, and poise. Based off what I read, I thought I did a good job. But based on what she looks like in the films, I am completely off. The film version is much more weak in my opinion. I don't think the film version could be the interim ruler of Stormhold. The film version felt like a stereotypical gypsy fortune teller than a princess in captivity. Tristran -- I tried to make him a combination of Dustin and Lady Una. So like his father, he has the curly hair that I seemed to have just made up. And then I added in the narrow and catlike features of his mother. But seeing as I got both his father and mother wrong, there's no surprise I got him wrong too. Like his father, I remember him having chestnut brown hair. The film version of Tristran is actually pretty likable. His character has straight hair rather than curly hair, but his naive but thoughtful demeanor is similar. Yvaine -- my Yvaine is pretty off like the rest of my characters. But I actually like all three interpretation of Yvaine I've seen: the original comic book, the film version, and my version. The original comic book version gives her a very natural and untempered look. I really like it. She certainly looks mystical. The film version is much more earthly but I didn't mind it all. In my version, I tried to make her look like she came from a different universe. Here hair is something that slightly defies gravity. I also made here younger than she is supposed to be. Witch Queen -- I kind of just drew somebody who could look to be a school teacher.